It happens to everyone at some point: no matter how hard you tie and even double-knot your shoelaces, the laces come undone. It’s bad enough when it happens during a regular run, but it can spell disaster when it happens during a race. Precious seconds tick when a runner must dash to the side of the road to re-tie laces (please tell me you follow running etiquette and make your way to the far right on the race course if you ever need to stop). Worse yet is when the runner either (1) stops in the middle of the course and blocks the people behind him, or (2) continues running with the shoelaces untied, endangering both himself and those who will crash into him when he trips over those laces. You might wonder who would ever be crazy enough to run with laces untied, but I can tell you I saw two racers do it at the Brea 8K this year. It took all I had to bite my tongue and not chastise those runners. In retrospect what I should have yelled at them was, “Buy some Lock Laces!” (This is not a sponsored post. The lovely Lock Laces people have no idea who I am. However, the Amazon product image is an affiliate link). Lock Laces are elastic laces that replace your regular shoelaces. Instead of tying them you cinch them with an adjustable toggle. – they’re relatively inexpensive — I’ve seen them for sale for anywhere from $3 to $8 per pair. – they can take some getting used to and some fiddling to adjust them properly. Cinch them too tightly and the shoes become uncomfortable, too loosely and your feet move around in the shoes. – Some people might be bothered by the end clasps flopping around but that is easily solved by tucking the ends underneath the rest of the elastic laces just as you might tuck in regular shoelace tips. Obviously I am a convert and I love my Lock Laces. It’s one less thing to worry about on race day. I wore them for the Santa Barbara International Marathon last November and did not have any problems. Do you use Lock Laces? What do you think of them? During the last two and a half months of “off-season” I’ve been following a loose plan of running three days per week and cross-training at least two other days. During triathlon season, my cross-training would consist of a mix of swimming and cycling. Ever since the Nautica Malibu olympic distance triathlon though, I’ve wanted a break from swimming. Maybe it was all the work I did on open water swimming, but I simply burned out on spending time in the water. What is an off-season for if not to recharge and ready oneself to get back to training as usual? 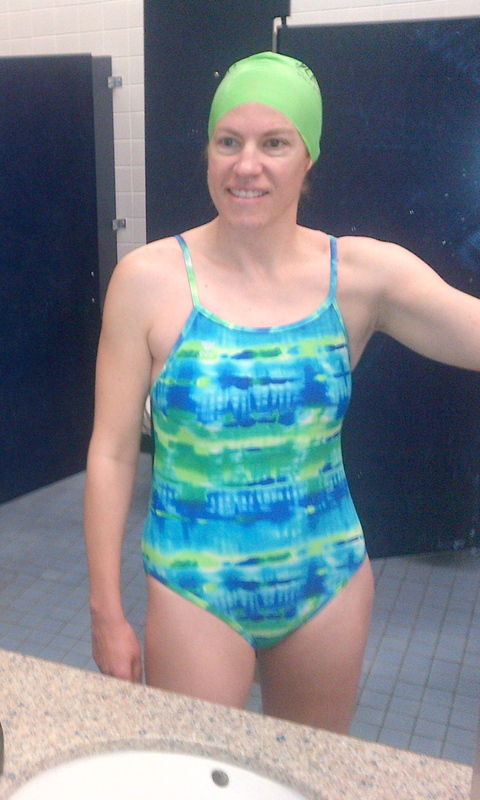 Me entertaining myself with the old cell-phone-photo-in-the-mirror trick, showing you how my Nautica Malibu tri cap happens to match my favorite TYR reversible swimsuit. Somehow, fate conspired to get me back into the water. Last week I helped my fifth grader get ready for her “Famous American” oral report on Clara Barton (founder of the American Red Cross). My daughter and I shopped at the thrift store for a long skirt in keeping with the Civil War era clothing. She tried on several skirts with a white blouse we also found on the rack. I asked her if we should buy the white shirt too, but she insisted she had a blouse at home already. “Does it still fit you? Do you know where it is?” Yes, yes. In reality? No, no. That’s how, the day before the report was due, I found myself back at the thrift store, plunking down $3 for that darn white blouse. plus 1 lap your choice to make it a full swim mile (33 laps). I swam at a leisurely pace with no rest intervals in between. I suppose I should start throwing some speed work in to my swim workouts sometime soon. I don’t have a triathlon on my calendar right now but I do like to stay in shape in the pool. I plan to start picking from some of these 50 Swim Workouts. That requires printing out the workout and putting the paper in a Ziploc bag so it doesn’t get wet poolside, but I trust that someday I will be organized enough to plan ahead and do just that! Do you cross-train with swimming or train for triathlons? What’s your favorite workout in the pool? January represented the last month in the off-season for me. I took it relatively easy as I tried to heal from shin splints and an adductor magnus groin strain injury. Note that my triathlon training positively requires me to write up the miles in swim-bike-run order, followed by other miscellaneous workouts. If you count the one yardwork and two big housework days, that constitutes 28 workout days out of 31. Are you shocked that it only took me 30 minutes to shape, frost and decorate this cake? No? Come on, you know you want to hire me for all your future cake-baking needs. 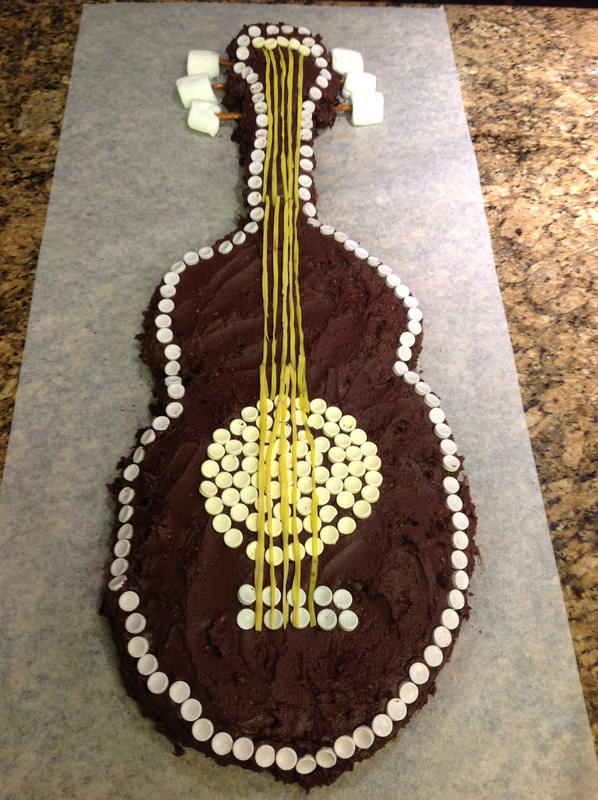 Random fun fact of the day: the hole in a guitar is called a “sound hole.” If you want to be accurate in your cake decoration, the sound hole should be placed in the upper portion of the sound board. If you want children to help you make a sound hole out of yellow Smarties 15 minutes before the guest of honor is expected to arrive, then you let them put it wherever it fits on the cake. And then you order your guests to help cut yellow guitar “strings” out of licorice. Again, do not feel the need to be accurate in the number of strings that belong on a guitar (typically, six). Run the Brea 8K and earn a PR at that distance. Start training for the Mountains 2 Beach Marathon. Do not injure myself (a perennial goal). *got up with the baby three times during the night before the race (any new-ish mother, anywhere). Those aren’t excuses. I’m saying that it’s useless to tie your self-worth to a race time because there’s never going to be another person out there just like you, racing under conditions just like yours. Finishers at the Chicago Marathon in 2005. Photo by rbackowski. Think about it another way. Who is more “worthy” of admiration after completing a marathon? 1. The 23-year-old female who’s been running for 5 years and comes in at around 3 hours. 2. The 41-year-old female who’s been running for 1.5 years and comes in at around 4 hours (*cough cough*). 3. The 35-year-old with type 2 diabetes who’s lost 30 pounds in training and comes in around 5 hours. I’d argue they are equally worthy of admiration. They each ran 26.2 miles. They each put in a tremendous amount of effort to achieve those times. They each faced different challenges on race day. I race against me, myself and I, and sometimes it’s still not a fair race. When you sign up in November for a race in June, who knows what will happen in between now and then? Injury? Family crisis? Weather? Perfect conditions? Crash? Take your satisfaction from checking off each workout in the training plan. Consider any race finish the icing on the cake. And if you do happen to PR? We know it was hard-fought and well-earned and should be celebrated. I cornered my husband for an interview about his experience at HITS Palm Springs 2012 on Sunday. He did his first sprint triathlon and came in 6th of 12 in his 40-44 age group and 91st of 238 overall! A newbie crosses the line to become a triathlete! 1. Congratulations on your first triathlon! How do you feel 36 hours later? Sore! Accomplished. Proud of wife because of her triathlon adventures and her super fast times! 2. What was the farthest race you had run before doing a triathlon? What was your experience with cycling and swimming? What did you work on most as you prepared for the tri? I had done a few 5K races. The longest run for fun I’d ever done was 9 miles. I’d never competed before on the bike or swimming. At first I had to see if I could even do the swim — swim that half-mile distance. I did a couple of weeks of swim tryouts and I realized I could do it. Then I got out Your First Triathlon and started following one of the training plans from that. 3. What surprised you about the training? Nothing really surprised me. I knew what to expect from watching you train. It turned out about like I expected — you have to commit to it, you have to prioritize the training over other things. It put a dent in some of my other activities like music, and I quit yoga and Pilates in order to spend the time on training. 4. What surprised you about the triathlon itself? The swim. The swim start was unmanageable. I was on the verge of having to float for a while to catch my breath. In the pool it was no big deal. I could get my groove, I could push myself to the limit and back off when it got to be too much, and never break my stroke. But when you’ve got hundreds of bodies interfering with your kicking, and splashing you, and going out of the gate so fast, it interferes with your stroke and your breathing and it’s hard to get back to your pace. After about 100 or 200 yards I had a moment of worry that it might be the end of my race and I could not keep on going. So I flipped over on my back and did backstroke for a while, then I floated on my back while I kicked my legs to catch my breath. After a while I was able to flip back over and complete the swim at my normal pace. My dead legs on the run surprised me too. I got a decent time for the run — 26:03 — but I would have estimated it was 30 minutes based on the way I felt. 5. Do you feel like just from doing this triathlon, you’ll be better prepared for the swim start next time? Yes, for sure. There’s some nervousness at the start of the race that freaks you out a bit. Having all those people around you makes you freak out. I think that there are a few other things that could help. Practicing a shore start at a lake. Also practicing swimming through surf waves would be a good way to try that out because you have to put out a lot of exertion right through the start and then come back and get your groove. 6. What did you learn from doing your first tri? What do you wish you had known before going into the race? I wish I had had some more coping skills for the swim start. I also need a tri kit for the bike because I was the only shirtless bike rider out there, to the point that I worried that it was against the rules. [It wasn’t]. 7. What did you think of the HITS Palm Springs organization? Would you do the race again? I think they did a great job. They did a better job than last year [the first year of the series, when I did the Olympic distance race]. It’s a really great venue and the organizers are really nice people. They’re cool and they care a lot about the racers and the sport and it comes through in their attitude. I would definitely do the race again. 8. What’s your advice for someone considering signing up for a triathlon? 9. What are your goals now that you’ve successfully completed a sprint? Don’t overeat. Keep up the training. Sign up for another one at some point! Thanks Mike! I am very proud of you for challenging yourself with the training and race and I’m glad it went so well! Any other triathletes out there? What was your first triathlon like? What advice would you give someone who is considering signing up for his or her first tri?